Experience the fun and excitement of Phantoms hockey at PPL Center with a Family 3-Pack! Available now for Lehigh Valley’s April 13 showdown at PPL Center against the Bridgeport Sound Tigers. Family 3-Packs include 3 tickets, 3 sodas and 3 hot dogs for just $67.50. 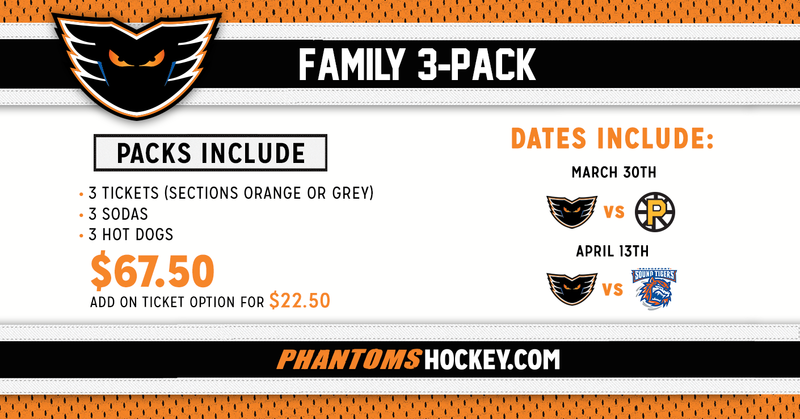 Call the Phantoms office today at 610-224-GOAL  to secure your Family 3-Pack now!